The 2014 offseason was a bad time for the Pittsburgh Penguins franchise. The team had just blown a 3-1 lead against the New York Rangers with a chance to go back to their second straight Eastern Conference Finals, a feat that was hoped would wash the bad taste out of the city's mouth after they managed only 2 goals in a sweep to the Boston Bruins the year before. The team fired Ray Shero and (eventually) Dan Bylsma, and the search for their replacements painted the picture of a franchise in disarray. During the search for their next GM, the Pens were reportedly turned down by agent Pat Brisson and broadcaster Pierre McGuire before settling for Jim Rutherford, who had a less than stellar track record during his time with the Hartford/Carolina franchise. It was a move ridiculed by many, myself included, especially the talk of taking the skilled but top heavy Penguins and turning them into a tough and gritty team. Making matters worse, the search for Bylsma's replacement was another prolonged, embarrassing affair that resulted in the underwhelming hire of Mike Johnston, who had previously been coaching the Portland Winterhawks of the OHL. Though Pittsburgh would start the 2014-15 season strong, they'd begin to fade down the stretch. By the time spring came around, the Pens were limping to the finish line, clinching a postseason berth on the last day of the regular season before meekly bouncing out of the playoffs at the hands of the Rangers in 5 games. At that point, it appeared that the worst fears were being realized of what a Rutherford run team would look like. However, something changed in a major way starting with the 2015 offseason. Whether Jason Botterill and Bill Guerin were given more control over personnel matters, Jim Rutherford was able to entirely switch gears in his old age, a combination of the two, or something else entirely, the front office began to function in a radically different manner. The Phil Kessel trade netted a supremely talented player for a bargain price, but it also saw the team dump Nick Spaling's bloated salary in the process - the same Nick Spaling the team was eager to acquire and extend in the hasty draft day trade that saw Patric Hornqvist and James Neal swap sweaters the year before. After paying lip service to analytics and nothing more, the team hired War on Ice co-creator Sam Ventura as an analytics consultant. The front office moved on from another bad contract they handed out the year before, this time possession anchor Brandon Sutter, and added Nick Bonino as part of the return. But perhaps the most significant move of the offseason was one that would go largely unnoticed until later in the year. Mike Sullivan, a former head coach for the Boston Bruins and long time assistant to John Tortorella, was hired to take over as the head coach in Wilkes-Barre. Because as much as the front office was building a new era team, it was still employing a decidedly old-school coach who would snuff the life out of his players. Mike Johnston might have fit the 2014-15 mantra for toughness and grittiness, but he was clueless on how to adapt to the evolving roster in front of him. The skilled team built for attacking the opponent's zone was asked to put too much emphasis on their own zone. A team lacking in prototypical "defensive defenseman" types asked its blueliners to try playing those roles anyways. It resulted in a team that was above average in keeping the puck out of their net and among the worst in putting it in the other team's. They were lifeless, defeated, and looked destined for early tee times before Johnston was fired and Sullivan was promoted. And if it seemed that the transactions over the 2015-16 season were golden for Pittsburgh, it's because Mike Sullivan had the Midas touch. He removed the shackles Johnston placed on his players, and they immediately became one of the best possession teams in the league. Rob Scuderi had quickly become an AHL caliber player after returning to Pittsburgh during the 2013 offseason. The Pens were finally able to find a willing trade partner, swapping Scuderi for Trevor Daley, who had struggled during his limited time in Chicago - Sullivan helped him look better than he had previously in his career. David Perron, acquired under Rutherford the season before, was swapped for Carl Hagelin, who had struggled during his limited time in Anaheim - Sullivan helped him become a more dangerous player and prolific scorer than he ever was during his first four seasons in the league. Justin Schultz had struggled, sometimes badly, during his time in Edmonton - Sullivan helped him find his proper role and allowed his talents to shine while limiting his liabilities. Sullivan even was able to help Ben Lovejoy become a productive player in the playoffs for Pittsburgh, finally helping the veteran blueliner display the type of game the Rutherford front office was looking for the previous season. As poorly as things went for the current front office in year 1, they couldn't have possibly rebounded any better in year 2. The Pittsburgh Penguin roster built on skill and speed began to hit its stride under Sullivan and didn't look back. They were too much for the league to handle down the stretch, winning 15 of their final 17 regular season games, and they proved to be too much for their opponents to handle in winning the Stanley Cup. 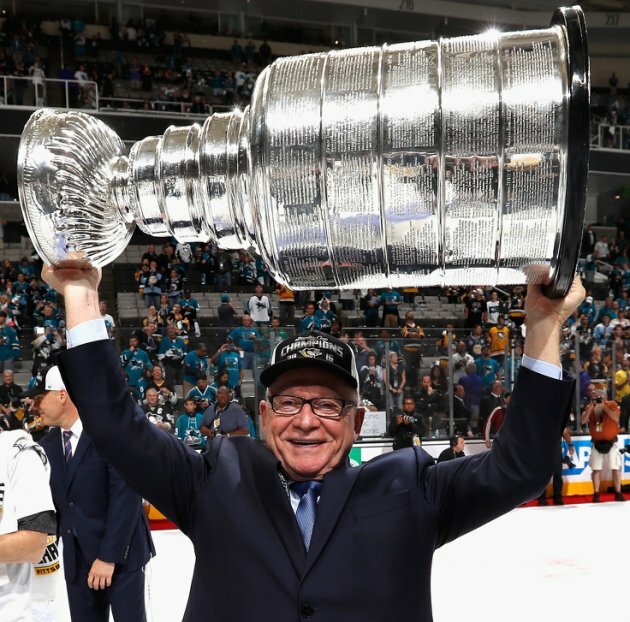 To add the cherry on top, Jim Rutherford took home the General Manager of the Year Award as voted on by his peers, becoming the 2nd Penguins' GM to win the award in its 7 year history after Ray Shero won in 2013. And as poorly as the team appeared to be trending after Shero's departure, there's no question now that Jim Rutherford is getting the last laugh when the dust has settled, and a team that was predicted to be on the decline now can see a bright future ahead of them once again.